It takes a disaster to shock us out of complacency. In January 1969, an oil well blew up off the coast of Santa Barbara, spilling an estimated three million gallons of black goo into the ocean—then the largest oil spill in U.S. waters ever. As images of dead birds and blackened beaches flooded the media, the modern environmental movement was born. Now in 2015, we’re dealing with yet another oil spill, once again off the coast of Santa Barbara. The ruptured pipeline has so far leaked only a fraction of the oil spilled in 1969, but it has haunting echoes of the decades-old catastrophe. The geology of Santa Barbara is blessed with beautiful beaches and lots of oil. Where California slides into the Pacific, oil naturally seeps out of the ground, hinting at the bounty below. Oil hunters have been drilling in the area since 1896, when the world’s first offshore oil rig was installed off the coast of Santa Barbara County. By 1969, large oil platforms were popping up along the coast. And on January 28, something went terribly wrong at Platform A, operated by Union Oil. As workers drilled a fifth well from the platform, it blew. The well had a protective casing 61 feet short of federal regulations. “The resulting explosion was so powerful it cracked the sea floor in five places, and crude oil spewed out of the rupture at a rate of 1,000 gallons an hour for a month before it could be slowed,” writes the LA Times. For a few days, the blowout was just something happening out at sea. But the spill spread. Oil bubbled out of not just the blown well, but several cracks along the ocean floor. By February 5, the oil slick had spread to shore, and now, things really started to look bad. 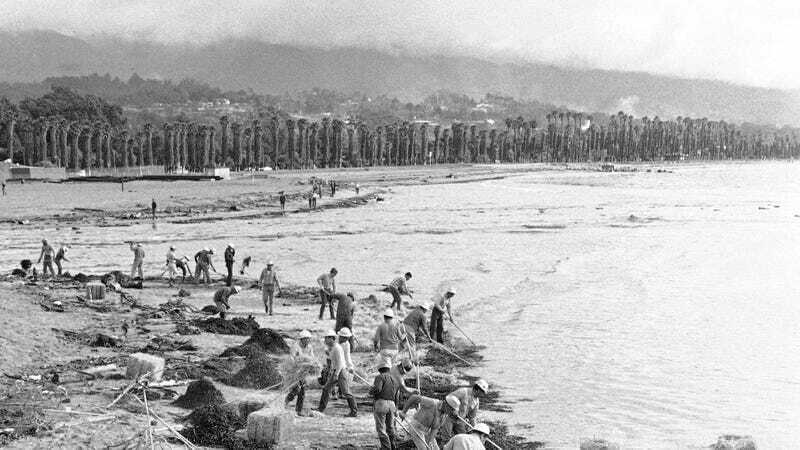 Santa Barbara’s beautiful beaches turned black. Birds slick with oil turned up. Dead elephant seals and sea lions lay strewn on the black beaches of nearby San Miguel Island. Clean-up efforts were crude. Workmen laid down cat litter and bales of straw to soak up the oil. Others steam-washed oil off of the rocks, killing any mussels clinging to them. Cleanup continued through the spring and summer, not ending until August. With devastating photos coming out of the oil spill, the public was galvanized into action—action that lead to real laws. President Richard Nixon signed the National Environmental Policy Act in 1969, the so-called “environmental Magna Carta.” Policies were passed to force oil companies to pay the cost of their spills. And few new leases for oil platforms have been issued in the area since. Earth Day was celebrated for the first time in 1970. But did the US really learn from this disaster? Existing oil and gas leases have since been developed. Today, there are 23 oil and gas platforms off the coast of California, more than in 1969. The 1969 oil spill has since been eclipsed in size by Exxon Valdez in 1989 and Deepwater Horizon in 2010. And now, we have yet another oil spill in Santa Barbara. History repeats itself.